The high reliability of our processors and years of practical experience led to the development of this unique processor. Ease of use, ease of maintenance and the fact that it is suitable for almost every application combine to be the main advantages of the STRUCTURIX U. With the STRUCTURIX U, you have at your disposal the most universal processor from our selection. STRUCTURIX U combines simplicity, reliability and universal use in one processor. It is specially designed for customers who use medium-sized quantities of film. The STRUCTURIX U is very versatile and processes sheet film as well as roll film. In response to conditions and the demanding requirements with regard to access time, an offshore version of the U processor is available. This STRUCTURIX U offshore version suits the specific offshore conditions and satisfies the demands with regard to processing time (90 sec.) and reliability. Easy trouble shooting and repair make this processor especially suitable for use on remote sites. Moreover, the built-in developer cooler allows operation in warm climates. The STRUCTURIX U is a dependable processor, no matter where installed. Built with solid components, the construction uses only simple and modern techniques. Thanks to its functional design, the processor operation is easy to control. An audio and visual signal indicate when the next film can be fed into the processor. The dryer level and the developer temperature level can be set using simple steps. 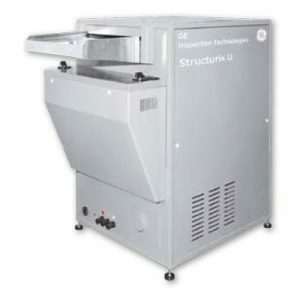 Three infrared drying units ensure uniform drying, in accordance with the principle of direct heat absorption. The fixer has its own heater element, which reduces the fixer warm up time considerably. This temperature control guarantees the film archival quality. Upon delivery, the STRUCTURIX U is set at the cycle time of 8 minutes. An optional cycle time from 1.5 to 12 min. can be set quickly and simply by an approved service engineer. Forward of the film feed slot five rollers accurately measure the surface area of the film. This unique film area scanning ensures a more precise economic and ecologic replenishment operation than if the film were only scanned lengthwise. The STRUCTURIX U can easily be fitted with the STRUCTURIX FEEDER. Just remove the film feeding tray in a few seconds and connect the film feeding system in its place. With the FEEDER, you convert the STRUCTURIX U into a practical, automatic daylight film feeding system.